International Criminal Law in Context provides a critical and contextual introduction to the fundamentals of international criminal law. It goes beyond a doctrinal analysis focused on the practice of international tribunals to draw on a variety of perspectives, capturing the complex processes of internationalisation that criminal law has experienced over the past few decades. • the role of victims in international criminal procedure. 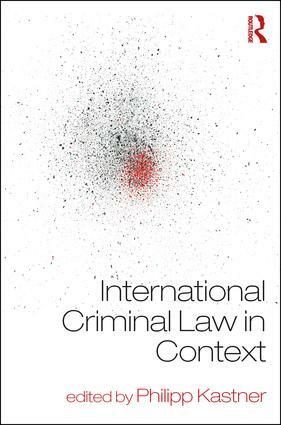 The book will appeal to those who want to study international criminal law in a critical and contextualised way. Presenting original research, it will also be of interest to scholars and practitioners already familiar with the main legal and policy issues relating to this body of law. Genocide: to prevent and punish "radical evil"
War crimes: increasing compliance with international humanitarian law through international criminal law? The crime of aggression: shifting authority for international peace? Philipp Kastner is an Assistant Professor in International Law at the Law School of the University of Western Australia in Perth, Australia.